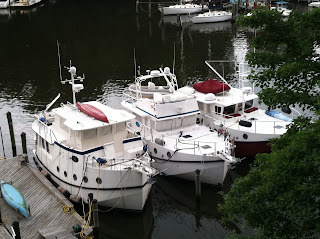 We stayed in Brunswick a little over a week doing boat chores and visiting friends. Upon our arrival we learned that our favorite downtown restaurant - Cargo - had closed. The food was always great and we enjoyed catching up with owners Jayson and Christie. We discovered that they now have an ice cream sto re - Moo Cow Cream - on St. Simons Island. Jayson's passion is making ice cream in unusual flavors. Unfortunately, they were closed due to equipment problems when we were there so we didn't get to try any avocado or roasted sweet potato ice cream. There were several other Great Harbour owners in Brunswick while we were there. We're always anxious to get together and see what others have done to their boats. Joe and I both were really envious of the Bora fans (wired in, 12 volt, draw practically nothing) that Mike and Linda Borum had installed on Sea Dream - Joe actually has dubbed them Borum Fans. After leaving Brunswick we were offshore for a fourteen hour day to arrive at the Gorgen's "Distant Isle Marina" just as the sun was setting. 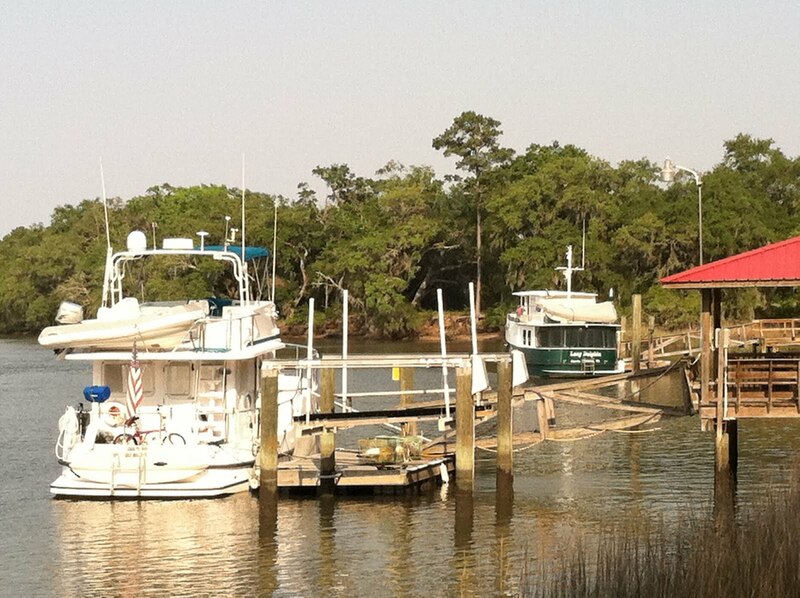 We always enjoy our visits with Chuck and Claria which included a boat trip to Salty Dog on Hilton Head for lunch. Klaas and Bettie (Moon Beam) joined us for dinner one night and later we picked Klaas up in Beaufort,SC so he could pilot Carolyn Ann into his creek to stay at a neighbor's dock. Along the way we met up with Randy and Barb (Lazy Dolphin) who followed us and stayed on another neighbor's dock. Coincidentally, Brooke and Dee (East Passage) arrived by car, so we had a great gathering for dinner. 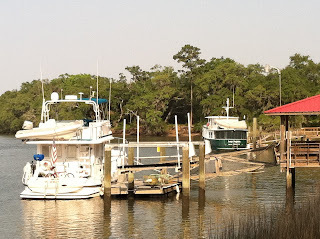 From Beaufort, we moved up to Charleston where Brooke and Dee had offered us the use of their slip on the Ashley River. One of these trips we'll do some real sightseeing in Charleston, but not this time. 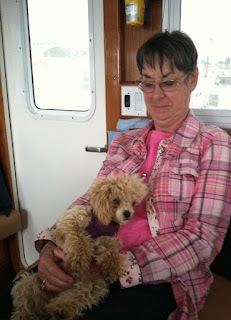 We left t he boat to spend Memorial Day weekend with my sister Lynn in Mt. Pleasant, just north of Charleston. We spent a quiet weekend visiting instead of joining the masses in the heat and humidity downtown. The gourmet breakfasts wer e a special treat. After the weekend we went back to the boat for a night, then drove down to Daytona for the annual get together of Park Police retirees. On the way to Daytona we made a stop at the West Marine in Jacksonville and picked up four "Borum" fans. Oddly, the weather was cooler in Daytona. After a little beach time and lots of catching up with old friends it was back to Charleston - and a trip to a West Marine for a couple more fans. From Charleston we started off with more long days looking for the cooler weather that should have been up north. Before crossing Albemarle Sound, we found a quiet, though buggy anchorage in East Lake. We made the usual stops on the way north - a weekend in Edenton, Elizabeth City with a visit and lunch with sister Jean, The Dismal Swamp was at its best - not smokey - and a beautiful day. It can be hard to tell where the water ends and the sky and trees begin. Portsmouth, VA has become a must stop so I can see my semi-annual movie. This time the new Johnny Depp Pirate movie was on. It really doesn't matter what the movie is, we enjoy the whole experience. The next day we left early and made it all the way to Pax River - near Solomons. Bettie and Klaas, who we visited in Beaufort, were there having windlass issues - the thing that brings the anchor up and down. 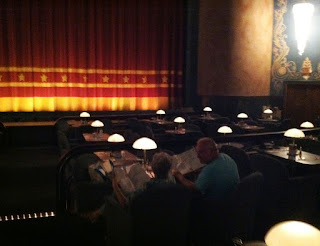 While Joe and Klaas worked on that, Bettie and I went to the the movies - two movies in less than a week! After not being able to solve the problem, we moved on to Jim and Judi's nearby. Oh, and Joe made another trip to West Marine - bringing our fan total to eight! We always enjoy our visits with our former neighbors, Jim and Judi, and appreciate their generosity. Thanks to them, we were able to drive up to Alexandria, VA to see our new great-nephew George - along with his parents, uncle and grandparents. Born a month early - at well over 6 pounds - George "the Red" is charming the whole family. Our son John happened to be there also as he was in town to accept an employee of the year award from an under-secretary of the Treasury Dept. - that's our boy! The next stop was Annapolis at the B & J Marina - aka Bruce and Joan's house. Bruce is a genius problem solver and wood worker extraordinaire. The problem to be solved was that of lowering our radar arch. On the western portion of the Erie Canal there are some fixed bridges with 15 1/2' clearances. With the arch up we can only get down around 17'. The arch is heavy and Joe and I together can't manage it without fear of dropping it. An elaborate post and pulley system was the result of Bruce and Joe's collaboration. We've got it on board, but expect that the easiest way to lower the arch will be to ask someone along the way to give us a hand. This troubles Bruce... While were there, Klaas and Bettie caught up with us. Luckily the B&J Marina always seems to have room for more! Not only did we enjoy visiting with them again, but we got to play with Joe's dog. Bettie thinks Chisai is her dog, but she's really just taking care of her for Joe. After a short hop we were at Bob and Elaine's house on the Magothy River. 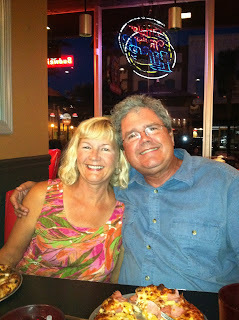 We met Bob and Elaine (Claddagh) in Waterford, NY at the beginning of the Erie Canal in 2009. Coincidentally, Bob's sister lives two streets over from our house in Gulf Breeze. 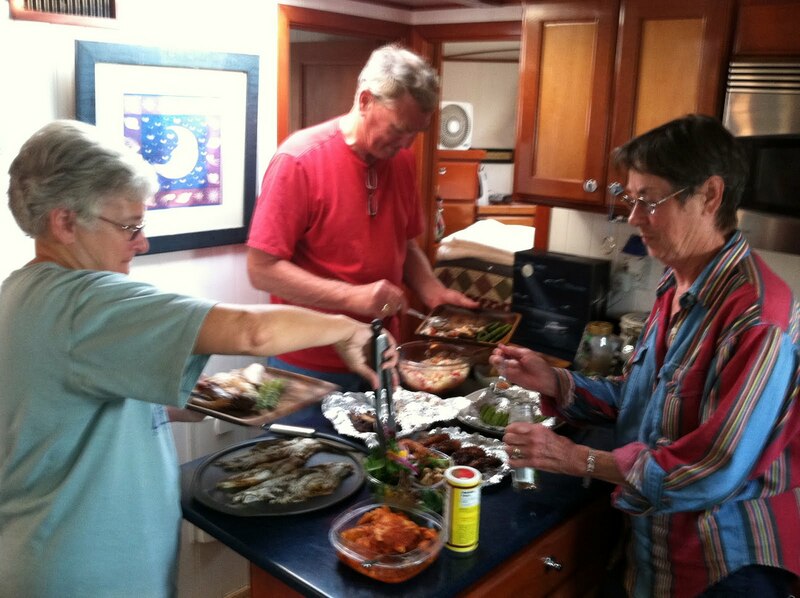 We spent time with them on the Erie and had heard about their house. Elaine had described the interior as rustic. The beams, paneling and doors were made from old telephone poles that were made of American Chestnut. The post at the bottom of the stairs is made from the tap root of a cherry tree that was on the property. Beautiful and such an interesting history. We had a great visit and Bob returned some charts we'd loaned them and even added some extra guides we'll need for the down-east loop - hopefully, next year. 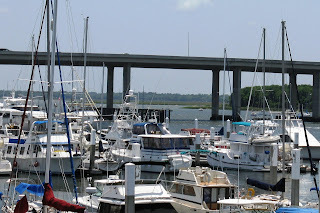 At Bob and Elaine's insistence, our next stop was Chesapeake City on the C&D Canal - which joins the Chesapeake and Delaware Bays. Along the way we saw another Great Harbour that turned out to be Sea Gypsy - one of the very early GH's built. Ron and Tina bought her last fall and were bringing her home for some updating. They also stopped in Chesapeake City which gave us an opportunity to become better acquainted. We arrived on Thursday and learned that the city fireworks were to be set off on Friday night. So we had to stay. While there we toured the museum about the history and building of the canal. It's small but very interesting - and free! Chesapeake City is small, but well maintained with lots of cute houses and shops. Friday evening there was a small parade as the boats piled into the basin for the fireworks. We had front row seats on the fly-bridge for a really good fireworks show. Our ever changing plans changed again as Joe got firework fever - which he blamed on me. At any rate, we decided to cruise up to Philadelphia for their Saturday night display. After some confusi on with the marinas, we got into a slip practically under a bridge. The bridge blocked the view of the fireworks from the boat - and the subway trains that ran across the bridge were annoying. The fireworks were visible from the dock, however, and it was a really good show. 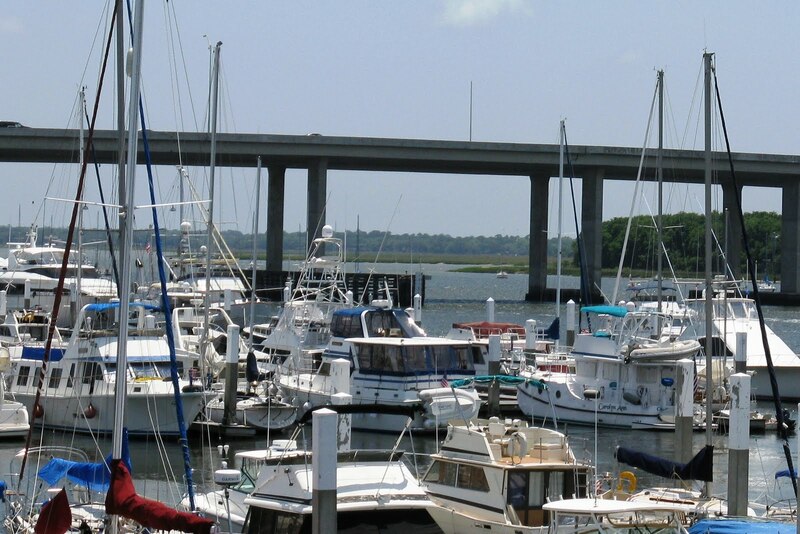 Joe's planning to do some research on the marinas there so we can make another trip in the future and do the sightseeing stuff. The following day we moved down to Delaware City - another small town, not as well restored as Chesapeake City but a nice stop. We took a ferry to Pea Patch Island to visit Fort Delaware. It was built after the War of 1812 when it was decided the cities up river needed more protection. The cannons there were never fired in defense of the fort, but it was used to house prisoners of war during the Civil War. The existing fort is actually the third to be built on the site, and has held up quite well - being about 150 years old. The staff there consists mainly of period interpreters - the year is 1863 - Union soldiers, Confederate prisoners, cooks, a blacksmith and others. You can ask them to "take their hat off" and they will answer questions out of character. We especially enjoyed our chat with a Confederate prisoner and a woman visitor whose great (or great-great?) grandfather had been a prisoner there. We left Delaware City intending to stop in Cape May, but we'd gotten such an early start and the conditions off shore were ideal. We went through the canal and on up to Atlantic City where Klaas and Bettie (Moon Beam, N-37) were waiting for us to join them for dinner. Conditions again being perfect the following day, we both went off shore up to Atlantic Highlands - the last stop before NY Harbor. We rafted together for one last dinner together. 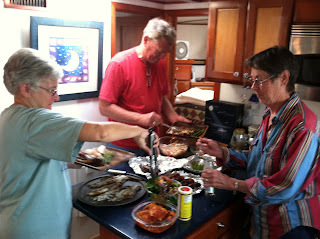 Joe had caught some fish while off shore and we had various left overs to combine for a veritable feast.